West end of Promenade Champlain, Gatineau Park, PQ. View to west from Champlain Lookout, Gatineau Park. This location provides a magnificent overview of the Ottawa Valley (Ottawa-Bonnechere Graben). The retaining wall of the Champlain Lookout is built from Precambrian rocks found within the park and provides a vantage point to view the Ottawa-Bonnechere Graben, a rift valley considered to represent a failed arm of the Iapetus Ocean, the precurser to the Atlantic Ocean. The information plaques at the site provide an overview of the geological history of the National Capital Area. 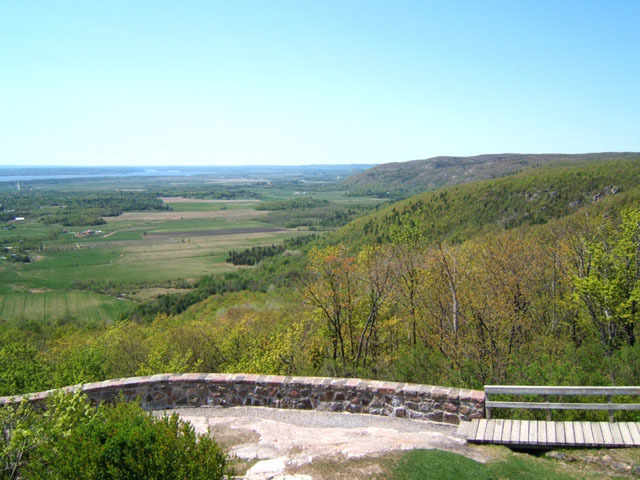 The Champlain Lookout sits atop the Eardley escarpment, assumed to be an extension of the Eardley Fault system, which developed about 175 million years ago. Sedimentary rocks of Paleozoic age were preserved in the down-dropped block of the Ottawa Valley, while equivalent rocks have been removed by erosion on this side of the fault. Here, Precambrian rocks are exposed. The flat-lying sedimentary rocks in the valley are covered by unconsolidated sediments deposited during and after the last Ice Age when, first, glaciers moved across the country and then the cold Champlain Sea flooded the lowland and thick deposits of silt and clay were laid down.